Ablation in its many forms is an attractive alternative treatment for patients unable to have a resection. 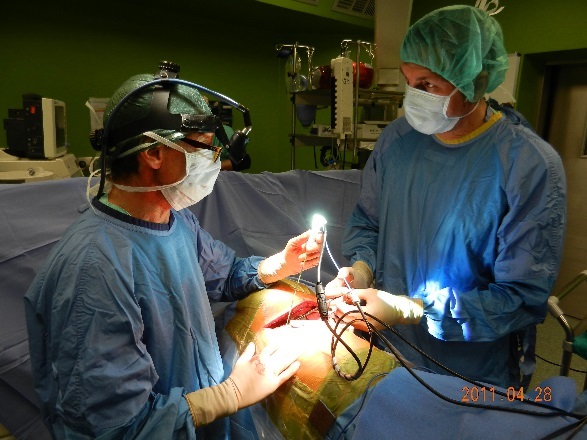 Ablation has also been used as an adjunct to resection, with patients having the majority of the diseased-tissue burden resected, with remaining disease eradicated via ablation. Patients often have liver tumors that are surgically unresectable because of either unfavorable anatomy or poor hepatic reserve. Therefore, ablative techniques have been widely integrated into the management options currently offered to these patients. Microwave ablation offers many of the benefits of RF but has several advantages that result in improved performance near blood vessels. During RF ablation, the zone of active tissue heating is limited to a few millimeters surrounding the active electrode, with the remainder of the ablation zone being heated via thermal conduction. Because of the much broader field of power density, microwave ablation results in a much larger zone of active heating. This larger heating zone allows for a more uniform tumor kill in the ablation zone, both within the targeted zone and next to blood vessels. In contrast, RF ablation is limited by the increase in impedance with tissue boiling and charring, because water vapor and char act as electrical insulators. The electromagnetic nature of microwaves make microwave ablations unaffected by this limitation. This allows the temperature to be driven considerably higher, resulting in a considerably larger ablation zone within a shorter ablation time. Also, it’s been noted that selected patients with isolated hepatic metastases who undergo hepatic resection often develop new tumors. Therefore, the broad convection profile of thermocoagulation via microwave ablation makes microwave ablation more suitable for treating patients with larger hepatic metastases. Increases in cross-sectional imaging as a first-line investigation for many indications has resulted in the earlier detection of asymptomatic renal tumors that may have otherwise remained undetected. Clinicians feel obligated to treat the disease once it is detected. The primary treatment of choice for renal and adrenal tumors remains resection. However, given the morbidity and mortality associated with nephrectomy, less invasive treatment techniques are often sought for smaller and more indolent tumors. The focused thermoablative properties of microwave ablation enables localized tumor destruction while preserving the uninvolved renal parenchyma. This ability to treat renal tumors while maintaining renal function makes microwave ablation of solitary renal masses an attractive option.